The dominant story of our times and the biggest threat to global peace is the persistent focus on our differences: from terror, negative rhetoric, intolerance and a deluge of confused information. And yet, in cities and communities across the UK, we are faced with the challenge of bringing our diverse communities together. Most of us feel powerless to do anything, but 91 Ways is determined to make a difference and to help build a more united city and make Bristol a beacon for peace. PLEASE HELP US TO CONTINUE OUR WORK …. 91 Ways uses the uniting power of food to build bridges between our communities. We don’t all speak the same language and sometimes think we have nothing in common, but we do have a commonality of experience – sharing food – which crosses divides and breaks down barriers. Sharing food is a universal experience and when we share food, we share our culture, our heritage and we open our hearts. Since the inception of 91 Ways in 2015 we have brought together over 10,000 people, speaking 40 different languages, from all areas of Bristol. We have held 125 events have used the uniting power of food, to start to bridge the gaps between Bristol’s 91 language communities and in the indigenous Bristolian populations. Since our first launch event, 91 Ways has kept growing and spawned all sorts of follow ups: centrepiece mass meals at food festivals, local community events across the city and a roving pop up International Peace Café. All of this has not only brought together diverse communities across the city and showcased a myriad of world food cultures, but it has also provided an opportunity for a group of refugee women in Bristol – from Syria, Somalia, Sudan and Eritrea – to become part of the wider community, show off their local food cultures and develop skills to help them pursue fledgling catering careers. We want to go deep into our communities both locally and nationally. Reaching into areas where people feel isolated, fearful and forgotten. We plan to visit all these communities and to hold inter-community events so people can meet people from their community and from other parts of Bristol. Our focus will be Avonmouth, Southmead, Lockleaze, Hartcliffe, Stockwood, Knowle West and Barton Hill. 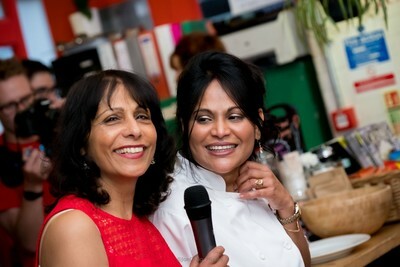 Our events will encourage people to make genuine connections with their neighbours from other cultures by using the uniting power of food, to cross these divides and talk about our traditions and heritage. Our events will feature food which is representative of that community and this acts as a starting point to talk, share personal stories, memories and cultural understandings throughout the event. These conversations lead to long-lasting connections and friendships. We will feature people’s recipes and memories on our website and share them with their community and others so that they can celebrate their diversity. We are also looking to expand some of these activities into other cities; in 2018 we have used our projects in Bristol as template to trial similar style community projects in Nottingham, Belfast and South Gloucester and the results of these have been very encouraging. We are always looking for volunteers to help with our events, and for community chefs who would like to share with us their food and recipes. Please contact us if you would like to join our volunteer team. We are excited to announce we will be welcoming Freddy Bird, Head Chef from the Lido in Bristol who will be sharing his passion for food from the Levant region. Join us at The Station from 7pm. Pre-order and pay for your wine in advance.